Worship is the most important thing we do in our parish family’s life. For us as Christians, worship is a necessity and a privilege – and we believe it changes the world. What is worship? Worship is, essentially, coming before God and acknowledging that he is God. Worship is giving thanks, placing our hopes and fears at God’s feet, interceding for the needs of the world, singing of God’s glory, affirming our faith, proclaiming the Kingdom. It is a holy communion and fellowship, and an encounter with the God who loves us. There are a number of ways you can get involved in supporting our Church’s worshipping life. We’re a busy church, with around 300 people at our Sunday services each week. Many are regular members of our congregation; others are new to church or simply visiting us. To help everyone feel welcome, we have a team of sidespeople and welcomers at our Sunday services. To join them in this ministry of welcome, please complete the form below. Our Welcome Desk is a key information point for many people – especially people who are new to church – at our main Sunday morning service. We’re always looking for friendly faces to join the team of people who staff it – we’d love you to join us. Please complete the form below in order to get involved. The role of server goes back to the earliest days of the Christian faith – as far back as the second century AD. 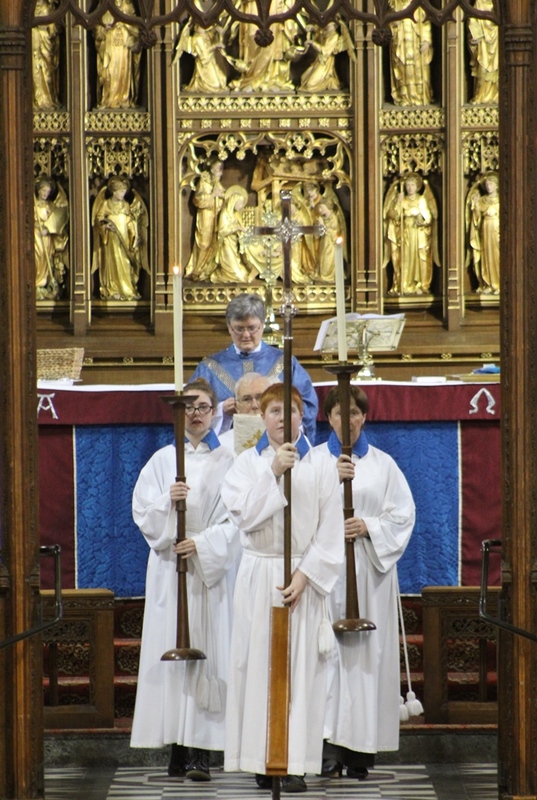 Servers support the worship of the Church in a very direct way, assisting the clergy during services and, in many cases, ensuring that the sanctuary is prepared for the service to take place and that the vessels and books used in the services are put away safely afterwards. Both of our churches have teams of servers who serve at Sunday morning services and on other occasions. On some occasions, there may be only one or two servers to assist the priest; at other times, a number of servers work together collaboratively to fulfil a range of roles. Adults and young people serve together in our parish. Training is provided. If you are a communicant member of our parish family, then we’d invite you to consider joining the serving team. To get involved, please fill in the form below.